The capacitance and dissipation factor test is an AC low voltage maintenance test and is very similar to the power factor test. The test as it is termed, measures the capacitance and dissipation factor (or loss factor) of the transformer insulation system. This test may be required to be performed during the acceptance testing stage to establish a baseline reading for future test comparison. While the transformer preparation is identical to the power factor test procedure, there is no requiremnts to make connection changes once the initial test set connections are made. High-voltage winding and low-voltage winding test set connection changes are made through a selector switch provided on the test set. Winding capacitance and dissipation factor test values are obtained by balancing a null meter for each variable at every the measured variable selector switch positions. Isolate the equipment, apply working grounds to all incoming and outgoing cables and disconnect all incoming and outgoing cables from the transformer bushing terminals. Disconnected cables should have sufficient clearance from the switchgear terminals greater that the phase spacing distance. Use nylon rope to hold cable away from incoming and outgoing terminals as required. Isolate the neutral bushing connection if applicable from the transformer grounding bar. Short-circuit all high voltage bushing terminals together. Short-circuit all low voltage bushing terminals and the neutral bushing terminal together. Connect the capacitance and dissipation factor test set. Refer to Figure 1 above. Record the capacitance and dissipation factor values once the null meter is balance for both phasing position. Record values for the five test-variable selector switch position. The condition of the bushings and the overall insulation of power transformers can be investigated by measuring the capacitance and dissipation factor, also known as the tangent delta, or power factor. Aging and decomposition of the insulation, or the ingress of water, increases the losses and thus more energy is turned into heat in the insulation. The level of this dissipation is expressed by the dissipation factor or power factor. What to do if the DF of Transformer is critically high say 5%? what is the acceptable range of values of Capacitance and Dissipation factor of Power Transformer (132KV) voltage level? 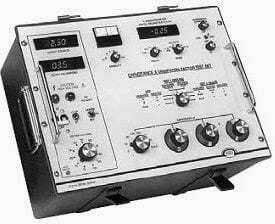 Please tell the what actually the CNDF equipment is giving the test equipment to get the results? For-example in megger the Megger device is giving the voltage to winding to get the results in Ohms so here what CNDF device is sending to transformer to get the results? or say internal theory of CNDF device ? If I doesn´t connect the shortcircuit between H1, H2, H3 and H0. How many is the tan delta value compared as when I shortcircuit them? Is it lower, because I excited less winding? Kindly tell me what is the Specific value of capacitance 7 dissipation factor of Power Transformer. Kindly reply to me above given E-mail Address. me waiting your best response. I have a query regarding the Insulation Power factor test results . There are various design of transformers which are available now for dry type and liquid type. Is there a base line which says that the IPF values for the dry type and liquid type should be (_) this value irrespective of the design of the transformer. Dear Vipin, feel free to use search box on the top. By chance will you have a segment on transformer doble testing? ?